All babies’ social skills develop at home with mommy and daddy. You are your child’s first playmate and friend. By interacting with you, your baby learns how to interact with other people. As he or she grows, their social skills will develop by leaps and bounds. There is a lot you can do to encourage his socialization with other people. Babies are social from birth. Your baby loves being held in your arms, seeing your smile and hearing you talk. The baby will watch your facial expressions and begin to imitate them by the time he is a few months old. Your baby will smile back at you, stick out her tongue and make a variety of other expressions. For the first several months of life, your baby will socialize with mom and dad. 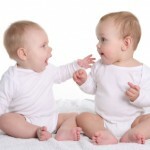 After four or five months of age, your baby will begin interacting with other people and other children. He or she still prefers family members to strangers, but will give the occasional smile to the older couple behind you in line at the grocery store. The best thing you can do at this stage is to continue interacting with your baby. If you notice, they tend to get nervous when approached by other people, so stick close and reassure your baby. This will help them feel safe and they will eventually get used to other people. Babies generally go through a few stages of separation anxiety. 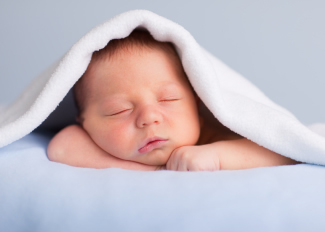 The first occurs at about seven months of age. 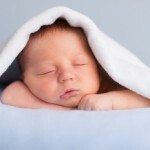 Your baby may have been very social for the past several months only to shy away from everyone now. Some babies will cry if anyone other than mommy or daddy holds them. This is very normal. It is normal for babies to go through stages of separation anxiety from now until eighteen months old. Separation anxiety is difficult on the whole family, including the [tag-tec]grandparents[/tag-tec]. Grandma’s feelings tend to get hurt when her beloved grand child cries and clings to mommy’s neck during a visit. Explain that the baby is going through a normal phase of separation anxiety. Encourage family members to engage in conversation and let the baby play with them from the comfort of your arms. It may take a while, but the baby will gradually warm up to his family. Around nine months old, your [tag-cat]baby[/tag-cat] understands language more and will attempt to communicate. They will smile and wave bye-bye when you prompt them. The best way to encourage this is to wave bye-bye and have your child imitate you. Your baby learns a great deal about communication and social skills by watching you and imitating your behaviors. Soon the baby will be waving bye-bye to every other shopper in the grocery store, the cashier and bag boy. Play groups are fun and mothers often join to help their babies make friends. In the first year of life, the play group is more for you than it is for your baby. Under a year old, babies don’t interact much with other [tag-ice]babies[/tag-ice]. When you put your baby down on the floor next to another baby, sit back and watch the interaction. You won’t see much. The babies will play side by side on the floor. They may look at each other occasionally, but they won’t play together until they are a bit older. Socialization is a gradual process and soon your baby will have many friends.